I’m finally ready for Tom Brady again. Are you? We watched as he was doubted at points during the second-to-most-recent NFL season—during which he was thirty-nine years old—only to come back and win the Super Bowl. We watched as he was lauded last season—at forty—only to lose the Super Bowl. We’ve listened to sports talk radio wonder how long he can play, how long he can be good, how long, how long, how long. I needed a break. How long, Oh Lord (Psalm 40), must we listen to stories about Tom Brady? It’s March, and I guess I’m ready again. The first thing I read that got me interested in Brady again was this article from the website FiveThirtyEight about Brady’s “TB12” method (subtitle: How to Achieve a Lifetime of Sustained Peak Performance) which reads like one of those 20/20 exposes of Benny Hinn’s ministry. You know, the ones where they catch, with hidden cameras, Hinn’s minions pre-placing empty wheelchairs and discover that his own ministry is buying thousands and thousands of copies of his book. Brady’s TB12 book, according to the piece, reads as more of an advertisement for a set of products (that he sells) than as honest-though-scientifically-suspect advice for achieving your best. His new (actually several months old, but like I said, I’m only just now ready for Brady again) Facebook show “Tom vs. Time” has very much the same ring to it. Tellingly, at the very beginning of the first episode, Brady goes into a cupboard of scrapbooks and pulls one out at random. It’s from 2007, the year the previously undefeated Patriots lost to the Giants in the Super Bowl. He mumbles something about how that wasn’t a very happy ending and puts the book back. He grabs 2015, which ended in a Super Bowl win over the Falcons. Cue the highlight reel, and we’re back in Benny Hinn land. 2007 doesn’t fit the narrative: Tom Brady is a winner, and he wants you to be one, too. Oh, and he just happens to have a couple products for sale that might help you get there. Aside from the shopworn hucksterism—which is as old as snake oil and Uncle Rufus’ Old-Fashioned Family Recipe Cure-All Tonic—the most interesting thing about “Tom vs. Time” is the un-self-consciously ironic nature of the whole enterprise. The title, of course, is the most obvious example, but they don’t run away from the idea. They play audio of talk radio hosts proclaiming that “Father Time is undefeated” and have Brady himself saying that, after eighteen years in the league, and all the practice and film sessions and input and coaching that have come with those years, he really should be perfect by now. He’s not kidding. 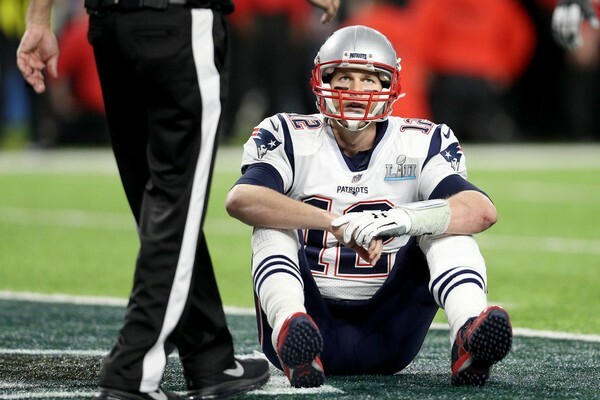 One of the first sentences Brady speaks in the series is, “If you want to compete with me, you better be ready to give up your life, because I am going to give up mine.” The tragedy of Tom Brady is that he is giving up his life even now. Sure, Gisele and the kids make a pretty family for Facebook’s cameras, but Brady’s quest is an onerous one. “If you choose something,” he says as he walks across his sun-dappled backyard, “you’re not choosing something else.” Fittingly, though sadly, he’s walking away from his family as he says it. What Brady is seeking so stringently is not actually victory, or greatness, or longevity, or acclaim. Though he doesn’t know it, he’s seeking forgiveness. Forgiveness for the mistakes he’s made in games, for the times he’s fallen short, for the times he’s chosen football over family. But he’s walking down a road that cannot—by definition—end in forgiveness, because forgiveness is not righteousness (however one defines it) achieved. Forgiveness is righteousness received.